We all know that S.T.A.L.K.E.R. game fans are able to create game mods but they also proved that they could also develop programs for simple and reliable mods usage. Smart Mod Manager will help you to manage your collection of mods, switch quickly between them, add and remove mods in any order. This program is also capable of merging mods together. GSC Game World announces its S.T.A.L.K.E.R. : Shadow of Chernobyl has sold 1 million copies worldwide and 1 million licensed copies in ex-USSR countries. "We are very pleased that S.T.A.L.K.E.R. became so popular among players from all over the world, - said GSC Game World CEO Sergiy Grygorovych. 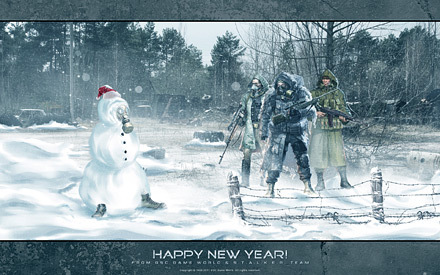 – S.T.A.L.K.E.R. is more than just a game now. Financial success will allow us to develop S.T.A.L.K.E.R. in different directions as a brand." On June 15, 2008 the final battle in the first S.T.A.L.K.E.R. online multiplayer tournament was staged. On behalf of GSC Game World, we express our gratitude to the organizers - game web-portal UkrGame.net and also Intel and ASUS companies for their help with the competition prizes. Our special thanks goes to the team of STALKER Hispano for their assistance with the server of the game. 31 may - 15 June 2008 S.T.A.L.K.E.R. multiplayer championship will take place. It is set up by the Ukrainian Portal UkrGame.net. We would like to invite all the gamers to try their fate and take part in this on-line competition.